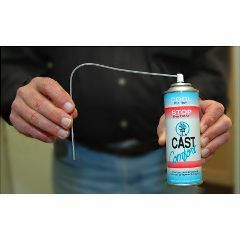 Cast Comfort Spray is a unique aerosol spray that keeps casted people happy! It is designed to be used under the cast, stopping the unbearable itching, soothing the skin and helping to eliminate embarrassing cast odor. Cast Comfort Spray is safe, effective and easy to use. Product was ok but i didn't really use it that much, so not really worth buying. The accessory hose to attach to the aerosol can didn't fit at all so I couldn't spray the product under my cast therefore the product really wasn't worth buying for me. My child loved this product while in a cast. It was very cooling and cut the odor immediately. by MRNCOR from FLORISSANT, MO. Easy To Use. Effective. Compact. Does relieve the itch and smell of a cast. Once at night for sleeping, and once during the day, helps to be comfortable with a bulky hot cast. Effective. Easy To Use. Durable. Compact. It has been a good relief for my daugther, no problem to use it. Reading last review, re: healing nerve sensitivity, is there an analgesic ingredient in addition to alcohol (and talc)?